Blenz is a coffeehouse that offers a limited menu that contains lattes, mochas, cold drinks and its own line of blends called Chillos. You also can order a coffee or espresso, but the company does not provide nutritional information for these drinks. Amy Rost, author of "Natural Healing Wisdom and Know How," reports that beverages can increase the amount of calories and fat you consume, depending on the drink you choose. Understanding what drinks have added fat and calories, as well as sugar, can help guide your decision. Lattes are one of the smartest blended coffees you can choose from at Blenz because they have fewer calories and less fat than some of the other blends. A Blenz Cafe Latte contains 119 calories and 4 g of fat. With 10 percent of your vitamin A needs and 45 percent of your vitamin D needs, the latte can be a healthy choice. The Royal Tea Latte has only 29 calories and 1 g of fat, and has 10 percent of the vitamin C you need. The Chai Latte provides 40 percent of you vitamin D and 25 percent of vitamin C, and has 171 calories and 4 g of fat. The mochas at Blenz are among your least healthy choices because they are high in fat and do not supply as many nutrients as the lattes. The Cafe Mocha has 18 g of fat and 388 calories. It also has almost one-fifth of the calcium you need every day. The Iced Mocha has 366 calories and 22 g of fat. The Mocha Chillo has 393 calories and 24 g of fat. The mochas provide a small amount of vitamin D.
The right cold drink can be low in calories and fat, but other cold drinks have just as many calories and grams of fat as the hot drinks. The Iced Chocolate has 417 calories and 21 g of fat, but does contain a significant amount of calcium and vitamin D. A smarter choice is the Iced Latte, with only 96 calories and 3 g of fat, as well as one-fourth of the calcium you need. The Shaken Iced Tea is another good choice, with just 60 calories and less than 1 g of fat. The Chillos provide between 3 and 5 g of protein in each serving, but contain several hundred calories and between 8 and 24 g of fat. The plain Fruit Chillo has 105 percent of your daily vitamin C requirements and 380 calories per serving. The Fruit Chillo with Ice Cream has 425 calories and 9 g of fat, but does offer 3 g of protein. The Cappachillo has 11 g of fat and 252 calories. The Mochachillo is the least healthy, with 24 g of fat and 393 calories. Blenz does not include the number of grams of sugar in each of its drinks on its nutritional menu, but Rost reports that many blended coffees contain added sugars that decrease the nutrition of your drink choice. Black coffee with skim milk or a small amount of honey is one way to keep calories and fat in check while still enjoying the taste of a sweetened coffee. 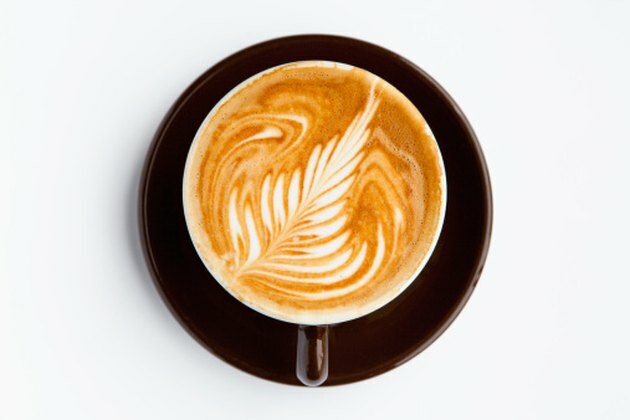 Another way to make your drink better is by adding skim milk rather than whole milk to your latte or mocha. What Vitamin Do I Need If I Crave Ice Cream?